Homily by Most Rev. Ignatius A. Kaigama, Archbishop of Jos and President, Catholic Bishops’ Conference of Nigeria, Bomadi, 15th December, 2017. What today is Benin City Ecclesiastical Province is particularly famous in the history of the Catholic Church in Nigeria because it hosted the first Catholic Portuguese priests of the Diocese of Lisbon, Portugal in the fifteenth century (about 1472). (The only remaining Vicariate in Nigeria as of today is Kontagora Vicariate). Remember too that only last October, Benin City Ecclesiastical Province hosted us to a remarkable national congress in Benin City to conclude our Marian year declared by the CBCN. We are back again to this same Province for this epoch making event of the elevation of the Bomadi Vicariate to a Diocese and the installation of Most Rev. Hyacinth Oroko Egbebo as its first Bishop. We thank God for the pastoral developments here and we wish the people of God greater pastoral progress, unity of purpose and harmony of heart in mind (cf. Acts 4:32). 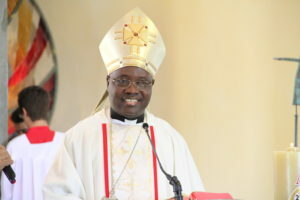 The growth of Bomadi from Missio sui iuris created in 1991 to a Vicariate in 1996 and the erection of the Vicariate along with the ordination of late Bishop Joseph Egerega as Apostolic Vicar on May 14, 1997 and in 2017 that it has become a diocese, we believe that it is evidence that the great work of the early and current missionaries has borne tremendous fruits. It was the Society of African Missions (SMA) who evangelized this area first. However, when the area was specifically mapped out as a Missio Sui Iuris territory, the continuing work of evangelization was committed by the Holy See through the Congregation for the Evangelization of Peoples to the Missionaries of St. Patrick Fathers with Monsignor Thomas Vincent Greenan, SPS, as its Ecclesiastical Superior. Missio Sui Iuris in Latin means an independent mission. It is a jurisdiction usually with very few Catholics or difficult to reach because of its geographical terrain. An Apostolic Prefecture is a missionary jurisdiction where the Catholic Church is not yet sufficiently developed to have it made a Diocese. An Apostolic Vicariate on the other hand is a jurisdiction created where a Diocese has not yet been established, with the hope that the region will produce a good number of Catholics for the Church to create a Diocese. You in Bomadi have fulfilled the requirements and so you deserve the status of a Diocese. The primary reason for the creation of any of these jurisdictions is evangelization and pastoral progress. Pope Francis in his message during the World Day of Mission for 2017 stressed that mission is at the heart of the Christian faith. He said, “the Church is missionary by nature; otherwise, she would no longer be the Church of Christ, but one group among many others that soon end up serving their purpose and passing away”. 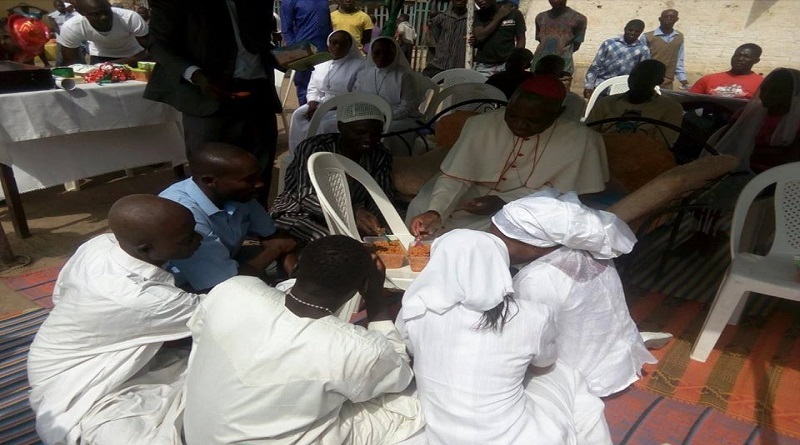 Recently, many Catholic Bishops were in Maiduguri to celebrate the success of mission work during the 50th anniversary of the founding of the diocese. We witnessed the vibrancy of faith and the joy of the faithful who even in the midst of Boko Haram attacks continue to exhibit incredible faith, which goes to show that nothing can separate the people from the love of Jesus Christ (cf. Rm 8:34-35). Catholics are known for remaining united under the Apostolic and pastoral leadership of the Holy Father the Pope. We are proudly and happily Catholic and our strength lies in our diversity which is a gift of God. We try our best not to fall into the temptation of parochialism, ethnocentrism or exclusion. It is in our DNA as Catholics to show fraternal communion which is why we the Bishops, priests, religious and laity from different parts of the country are here to express our solidarity with you in Bomadi and to assure you that we are one big family in Nigeria on mission. Though tribe and tongue may differ in the Catholic Church, we try to remedy this “tower of babel” reality. We encourage ourselves to speak the common language of faith because we have one Lord, one faith one father and Lord of all Eph 4:4-6 The waters of baptism should be thicker than the blood of tribe or cultural affiliation. As Bishops, our desire to know more about our Nigerian Church is what influenced our decision to rotate our September Bishops conference among the nine Provinces. The last conference was recently held in Jalingo where despite the distance, most of the Bishops travelled there. Apart from being a pastoral solidarity visit, it was also evangelization by presence. The upgrading of the Apostolic Vicariate to a Diocese confers on the Diocese what I consider a threefold duty: The duty to preach the Word of God, the duty to perform more good deeds and the duty to love and unity. During his earthly ministry Jesus was well known for his teaching and evangelizing mission. Turning to the passage in Is 61: 1-3, quoted in Lk 4:18-19, while in the synagogue of Nazareth, Jesus publicly presented himself as God’s annointrd one, i.e the Messiah and announced the five purposes for which he came: to preach the good news to the poor, to proclaim freedom for the prisoners and recovery of sight for the blind, to release the oppressed, to proclaim the year of the Lord’s favour. Obviously, his ministry was a mixture of the social, pastoral and spiritual, but the first and most important was the ministry of the word (evangelization). . It is through such evangelization and by the grace of God that today the population of Bomadi Diocese is about 40,000 Catholics with 23 parishes, 2 university Chaplaincies and numerous outstations. There is a growing number of diocesan priests, fidei donum priests, religious priests, sisters from four Congregations, dedicated Catechists and a considerable number of major and minor seminarians. It was not surprising therefore that after twenty one years as a Vicariate the Holy Father upgraded it to the status of a diocese. Congratulations to Bishop Egbebo who has piloted the affairs of what was then a Vicariate with admirable dedication, which has given birth to this brand new diocese in the Niger Delta area; of course, with the active support and collaboration of priests, religious and the lay faithful. We are more convinced now that you in Bomadi jurisdiction do not only produce a lot of oil which generates most of Nigeria’s income but you are also working seriously for the salvation of souls through spiritual and social transformation. You therefore contribute to the country also by producing men and women of sound spiritual depth and holiness; men and women who love the Church and are ready to sacrifice time, talents and resources to enhance its growth and expansion. To God be glory, hounour and adoration. In an attempt to fulfill its social obligation, even with its very limited resources, the Catholic Church in Bomadi owns and runs five secondary schools and has four health centres. There are very positive signs of further development and growth. Negotiations are on for the handing over of some schools previously owned by the mission back to the Church. We hope the government will hasten action and kindly return these schools. At the inception of the Vicariate in 1991, Bomadi Missio Sui Iuris had only four priests including the Ecclesiastical Superior, without a single indigenous clergy. However, the following year 1992, witnessed the ordination of the first indigenous priest, Rev Fr. James Morkor. 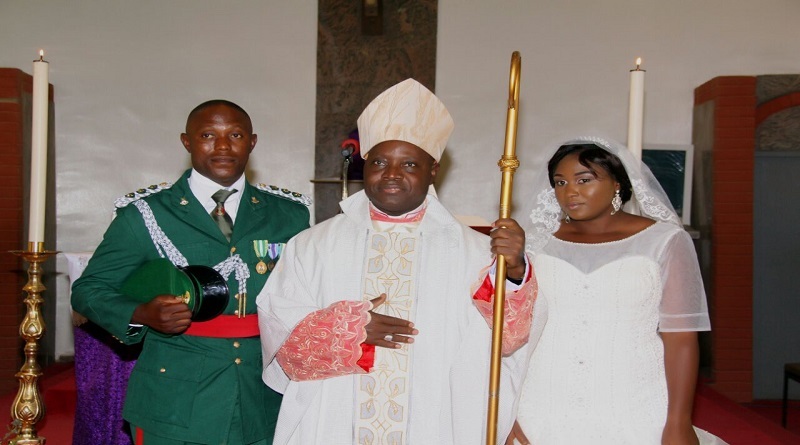 Soon after, three indigenes of the area were also ordained priests for the Missionary Society of Saint Paul of Nigeria (MSP), one of whom is today the Bishop of Bomadi Diocese: Most Rev. Hyacinth Oroko Egbebo, MSP. To the glory of God today the diocese boasts of many priests. These priests together with their chief shepherd have their job description in the first reading from Is 61:1-3, namely, to bring the good news to the poor while the second reading from Hebrews 5:1-10 spells out the type of quality service expected of good pastors. They are expected to offer prayers and entreaties for the people, to understand and support those who are ignorant and going astray, to act on behalf of men in relation to God, etc. The words of today’s gospel urging us to practical love are very clear in Jn 15:9-17. Jesus said to his disciples, “As the Father has loved me, so have I loved you; abide in my love. If you keep my commandments, you will abide in my love, just as I have kept my Father’s commandments and abide in his love. These things I have spoken to you, that my joy may be in you, and that your joy may be full. This is my commandment, that you love one another as I have loved you”. At a time when some preachers present Christianity as a project of miracles and prosperity or a matter of cult personality, we owe it a duty to insist that holiness of life, good daily conduct and performance of good works especially helping the weak and the poor irrespective of tribe, status or religious affiliation should be our priority. Our doors must be wide open to the poor and the underprivileged who ate so many in Nigeria today, especially those lacking the basic necessities of life, those owed months of salaries, retired and grieving pensioners, the army of unemployed youths and the growing numbers who are poor due to no fault of theirs. We continue to call on government to bring about development at all levels and to look seriously into the poor conditions of most roads, the incessant strikes by workers in health or educational institutions, the developing culture of mediocrity linked to the god father syndrome or whom you know, the kidnapping of innocent people, etc. Up to now, six Rev. Sisters of the Eucharistic Heart of Jesus are languishing in captivity suffering the terrible traumatic experience many kidnapped persons have undergone. In the name of Almighty God and in the name of our common humanity we plead with the kidnappers to kindly release the Rev. Sisters unharmed please. They were simply serving poor and needy persons and their God when about four weeks ago they were taken away from their house! Let us intensify prayers for their immediate release. We also call on the government to respond to the yearnings of the teeming unemployed youths especially here in the Niger Delta – the area that lays the golden egg. 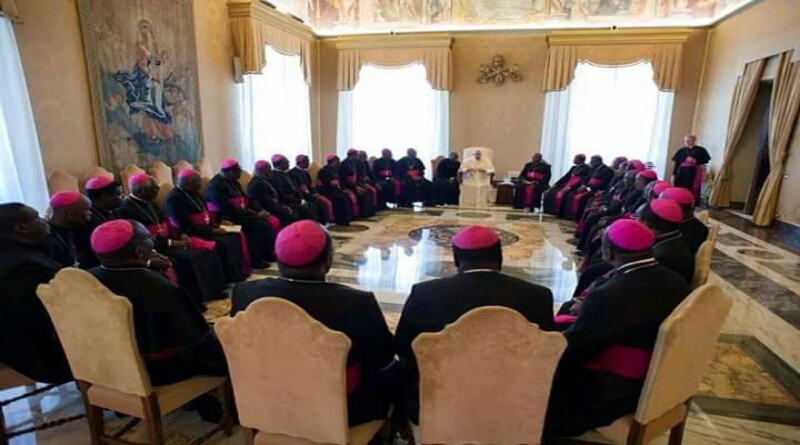 In conclusion, please permit me to advise the people of Hod in this new Bomadi Diocese on the need for even a greater collaboration among the priests, religious and the laity in communion with your Bishop so that together you can all promote and demonstrate the spirit of peace and unity among all the tribes in this jurisdiction. This will catapult your new Diocese to very great heights. I understand that this Diocese has a diversity of ethnic groups with the Izons of the Ijaw ethnic nationality, believed to be one of the largest, and other ethnic communities such as Ogbia, Nembe, Akassa, Epie-Atissa, Odual, Engeni, Urhobos and Isokos. There should be visible unity, a special characteristic of the Catholic Church. Priests, Religious and the Laity should see the Bishop as a father, a friend and a brother while the Bishop ministers to them as his sons, daughters, friends and co-responsible agents of evangelization. May the love, peace and blessings of Jesus whom we shall soon celebrate at Christmas abide with all of us now and forever. Next story CHRISTMAS: JOY TO THE PRISONERS!